If you're obsessed with practicality dressing when it comes to your personal style, you'll love this chic pairing of a Hanky Panky long sleeve lace tee and black leggings. 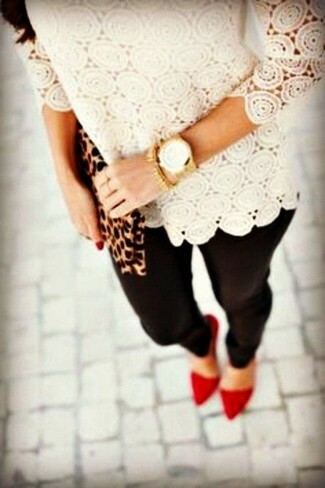 Rocking a pair of red suede pumps is an easy way to add some flair to your look. This combo of a beige lace long sleeve t-shirt and a beige lace skater skirt is effortless, totally chic and very easy to replicate! If you're looking for a casual yet totally chic outfit, pair a Hanky Panky long sleeve lace tee from Nordstrom with a red pleated midi skirt. Both garments are totally comfy and will look fabulous together. Bring a touch of sophistication to your getup with beige leather pumps. If you're looking for a casual yet totally chic look, pair a Hanky Panky long sleeve lace tee from Nordstrom with tan leather shorts. Both pieces are totally comfy and will look fabulous together. Rocking a pair of black suede heeled sandals is a simple way to add extra flair to your getup.